If you visit the city of Guilin, you will undoubtedly come across elephants. Whether they are in a business’ logo, a restaurant’s name, or on the front of a travel brochure, elephants have become a symbol of Guilin, and this is all thanks to Elephant Trunk Hill. 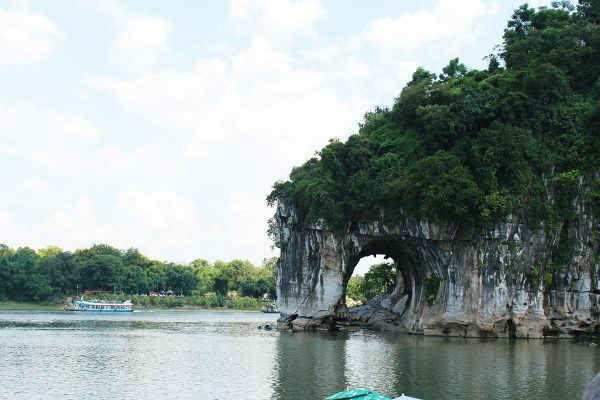 Locals in Guilin say that if you have been to Elephant Trunk Hill then you have been to Guilin, which shows just how important this natural wonder is to the city and its people. Elephant Trunk Hill (Xiangbi Hill) is a Karst formation that has naturally formed on the western bank of the Li River just outside of Guilin city. It is so named because it looks like a thirsty elephant dipping its trunk into the river to drink. It rises over 55 metres over the waters of the Li River and measures 108 metres in length and 100 metres in width. In the past, it has been referred to by many names, such as “Li Hill”, “Yi Hill”, and “Chenshui Hill”, but it is now widely known as Elephant Trunk Hill. Between the “trunk” and the “legs” of the elephant, there is a large hole or cave known as Shui Yue or Water Moon Cave. It is a semi-round cave that has been completely penetrated by water, with the Li River flowing directly through it. The cave is 17 metres long, 12 metres high and 9.5 metres wide, meaning visitors can easily pass through the mouth of the cave on foot. Though this stunning cave is undoubtedly a beautiful sight during the day, it becomes most magnificent at dusk and nightfall. When the sun begins to set, the surrounding rock around the Water Moon Cave casts a shadow on the water and light can only pass directly through the cave itself. The light passing through the open mouth of the cave creates a reflection on the water that looks just like a full moon, hence the name “Water Moon Cave”. This natural phenomenon is unique to Water Moon Cave and has served to inspire Chinese poets and artists throughout the ages. If you travel into the mouth of the cave, you’ll find inscriptions on its walls applauding its beauty that date back to the Tang Dynasty (618-907). Among these inscriptions, there is even one by the poet Lu You (1125-1210), who was one of the four great poets of the Southern Song Dynasty (1127-1279). There is another, smaller cave embedded into the side of Elephant Trunk Hill that is often referred to as Elephant Eye Cave. It is so-called because it goes straight through the hill and is just above the “trunk” of the elephant, making it look like the “eyes” of the elephant. This cave is about 2 metres high, 5 to 10 metres wide and 52 meters long. Visitors can climb Elephant Trunk Hill to Elephant Eye Cave and are rewarded with a panoramic view of the surrounding landscape from the cave. If you’re an avid photographer and are feeling adventurous, we strongly recommend scaling the heights of the hill to reach Elephant Eye Cave, as it provides many unique photographic opportunities. Far off in the distance, on the elephant’s “back”, you may notice a small pagoda jutting out of the lush greenery. This is a 14 metre-high, two-storey pagoda called Puxian Pagoda, which was built during the Ming Dynasty (1368-1644). It is dedicated to an enlightened being or bodhisattva from the Buddhist faith known as Samantabhadra or Puxian in Chinese. Some people believe it looks like a beautiful vase on the elephant’s back, while others reckon it looks more like the hilt of a sword, and there is in fact a rather tragic legend behind the placement of this pagoda. The legend goes that, in ancient times, the Emperor of Heaven decided he wanted to conquer Earth. The Emperor led his troops to Earth while riding on the back of a mystical elephant. However, the strain of carrying the Emperor so far proved too much for the elephant and he became seriously ill. The local farmers nursed the elephant back to health and as a gesture of his immense gratitude the elephant deserted the Emperor and stayed on Earth to helped the farmers plough their fields. On discovering the elephant’s betrayal, the Emperor flew into a murderous rage. One day, when the elephant was drinking from the Li River, the Emperor threw a sword into his back, which turned him to stone. The kind elephant, who is now the Elephant Trunk Hill, is said to still watch over the people of Guilin and welcome visitors to the city he loves so much. The pagoda was built on the site where the sword supposedly landed in the elephant’s back. In 1986, Elephant Trunk Hill Park was built on the banks of the river surrounding Elephant Trunk Hill. It’s location on the waterfront makes it the perfect place to relax. The park is elephant themed so dotted throughout the park you’ll find adorable stone elephant statues poking their heads out of the water or standing near the paths. The trails that wind throughout the park have been designed so that, from a bird’s eye view, they spell the Chinese character for elephant (象). Just offshore from Elephant Trunk Hill, there is a small island that visitors can access via a stone bridge, which has been delightfully carved and decorated with elephants. This island is called Love Island and, with its peaceful bamboo groves, beautiful stone statues, and ideal view of the river, it’s the perfect place to relax and enjoy some private time with that special someone. There is also a temple of great cultural significance in the park called Yunfeng Temple, which was built during the Tang Dynasty (618-907). It is just southwest of Elephant Trunk Hill and is ranked as one of the four most famous temples in Guilin city. It had to be rebuilt in 1897 but is none-the-less magnificent. The temple has played an important political role in the area, being both the gathering place for the members of the Taiping Heavenly Kingdom (1850-1864) and one of the safe houses of Sun Yat-sen and his followers during the Revolution of 1911. The temple is now open to the public and exhibits several wonderful historical and cultural artefacts that were found in the Guilin area. Elephant Trunk Hill is easily accessible by road or by water. You can either take a cruise down the Li River, which will make a stop at Elephant Trunk Hill Park, or you can take one of many public buses from Guilin and get off at the Elephant Trunk Hill Park stop (象山公园站). Taiping Heavenly Kingdom: An oppositional state in China that was formed from 1851 to 1864 and controlled some parts of southern China during the Qing Dynasty (1644-1912).